A disruption to the food systems such as a natural disaster creates challenges for families and communities. Yet, there is no research on how these disasters disrupt the food supply system. Researchers are interested in hearing from farmers, people working in the transportation of food from farms to stores, those within the retail food industry, and families affected by the storm. Your story is the only way that researchers can learn about what went well after Hurricane Florence and about the challenges that families have been facing since the storm. 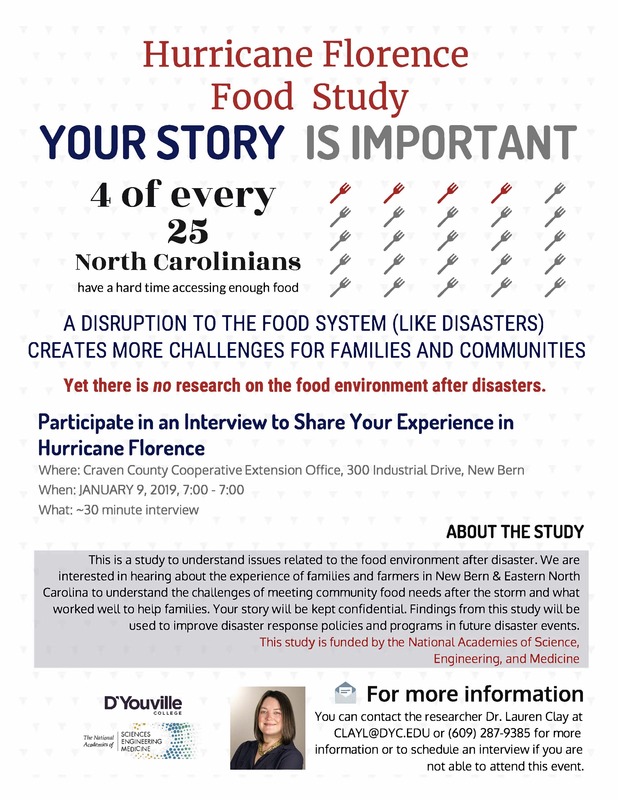 On January 9, 2019, from 7 a.m.–7 p.m., Dr. Lauren Clay, D’Youville College, will interview volunteers to better understand issues related to the food environment after a disaster. All information provided will be confidential. This study is funded by the National Academies of Science, Engineering, and Medicine. Please consider sharing your story to improve policies and programs that help make things easier for families in future disaster events. Appointments are not required but encouraged. Schedule an appointment or gather additional information by calling N.C. Cooperative Extension, Craven County Center at 252-633-1477. Interviews will last approximately 30-45 minutes. You can contact the researcher Dr. Lauren Clay at clayl@dyc.edu or (609) 287-9385 for more information or to schedule an interview if you are unable to attend.